There are a number of reasons you might be in need of an automotive locksmith. 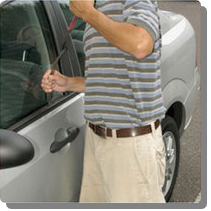 Are you locked out of your car/truck, need a replacement key, or just want to keep your vehicle from being stolen? San Antonio Locksmith is here to help! We have the most up-to-date and innovative automotive locksmith services, no matter what your need. If you need an emergency locksmith fast, you can expect to see us typically within 20 minutes. We can unlock any vehicle, trunk or glove compartment. Our licensed, insured and bonded professionals are courteous and responsible and will treat your vehicle with respect. We offer services for both foreign and domestic car/truck owners. Whether you are experiencing a car lock out, need lock repair for your car, truck or motorcycle, or are are looking to install new state-of-the-art locks, you can trust San Antonio Locksmith to get the job done quickly. Each of our technicians has at least 5 years of experience in the automotive locksmith business and has a top Better Business Bureau rating. We constantly stay up-to-date on the ever changing anti-theft devices and transponders. We typically charge about half of what car dealerships charge so we will save you money. We are available 24/7 to take care of your emergency locksmith needs. Call us today for fast, friendly service that can not be beat!